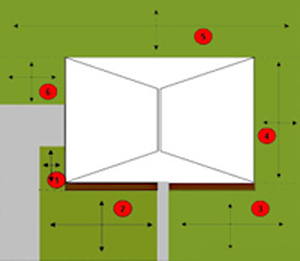 Divide the area needing sod into squares and rectangles. Use a measuring tape to measure the dimensions in feet. Calculate the area of each section to get the square footage. For instance, 3ft. length X 3ft. length = 9 square feet. Add all the sections together and divide by 450 to get the number of pallets you will need. A sunny area with well drained soil is best for lawn grasses. Level the soil approximately one-inch below patios, sidewalks and driveways so that when the sod is installed it won’t be higher or lower than the hard surface. Ask the delivery driver to space the pallets around the yard to reduce the time and distance you’ll have to carry each piece. If there is a slope, begin sodding at the bottom and work your way up the slope to keep the seam and joints tightly together. If the slope is steep, run the pieces across the direction of the slope. It is important to make sure you are applying sufficient water. In very hot weather, begin watering after each section is completed. Water should be applied to new turfgrass within 15 minutes after it is laid. Apply at least 2 to 3 cm. (1 inch) of water so that the soil beneath the turf is very wet. The soil 7 to 10 cm. (3 to 4 inches) should be moist. Pull back a corner of the turf and push a screwdriver or other sharp tool into the soil. It should push in easily and have moisture along the first 7 to 10 cm. (3 or 4 inches), if it doesn't, you need to apply more water. Corners and edges are easily missed and are vulnerable to drying out faster than the center portion. Areas near buildings may dry-out faster because of reflected heat and may require more water. Runoff may occur on some soils and sloped areas before the soil is adequately moist. To conserve water and ensure adequate soak-in, turn off the water when runoff begins, wait 30-minutes to an hour and restart the watering on the same area. Repeat this process until proper soil moisture is achieved. For the next two weeks keep the soil surface moist under the grass with daily watering. During especially hot, dry or windy periods increase watering amounts and frequency. As the turf starts to establish new roots into the soil, it will be difficult and/or harmful to pull back a corner to check under the turf, but you can still use a sharp tool to check moisture depth by pushing it through the turf and into the soil. Water sod as early in the morning as possible to take advantage of the normal growing cycle. Lower wind speeds and loss of water caused by high temperature evaporation make early morning the best time to water. For best results make the first application of balanced fertilizer three to four weeks following installation.